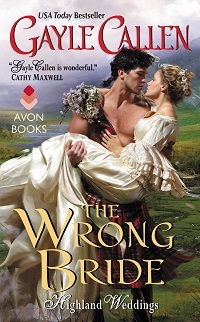 Welcome to my stop for The Wrong Bride by Gayle Callen, the first in her new Highland Weddings historical romance series. Please read on for my review and excerpt, be sure to check the tour stops to see what other readers thought of the title and don’t forget to enter the tour-wide giveaway where you could win one of Three (3) Print copies of THE WRONG BRIDE by Gayle Callen. From Gayle: A first kiss is always such a fun scene to write. They’re usually filled with conflict and chemistry and confusion—the three Cs! Riona shivered, but it wasn’t from the bathwater’s chill. It was from the frightening realization that there was something powerful between them, something that called to her, that made the risks Hugh had taken to have her for himself seem arousing, not just self-serving. There was a place inside her she’d never sensed before, surely a recklessness, a weakness. “Ye’re strangely quiet, lass,” he murmured. His gaze lazily moved over her face, dipping to her breasts, where the upper curves were displayed above the soapy water. Her skin felt … prickly, sensitive, even inflamed. “I’m not done fighting you,” she said at last, almost wincing at how breathless she sounded. A slow grin curved his mouth, even as he reached his hand to cup her face and tilt it toward him. The shock of his warm palm settling so gently on her skin made her tense, but she didn’t pull away, as if that would show that she’d given up, that she was afraid of what he could do to her … what he could make her feel. He leaned over the tub and kissed her, his palm guiding her head. She wanted to show him he didn’t move her, that this display meant nothing to her. But his lips were warm, and glided over hers with purpose, parted gently as if he wanted to taste her. She’d never been kissed … She felt her head swim at the sensation that seemed to travel down her body, to her breasts, to the pit of her stomach and between her thighs as if he’d touched her in her most secretive places. When his tongue traced her lower lip, she jerked back in surprise. He didn’t laugh, just studied her with those gray eyes that were considerably warmer. He kept his hand on her face, and his thumb caressed her cheek over and over. “Our first kiss bodes well for the future,” he said. He glanced down to her breasts again, and she stiffened. With a faint smile, he let her go and stood up. Not the topics she wanted to discuss, apparently, but she didn’t argue. He turned his back and went to the window, while she hastily dried herself and pulled on a dressing gown Mrs. Wallace had laid out for her, trying to forget the feel of his mouth on hers, and how instead of being afraid or disgusted, she’d felt … aroused. Her cousin Cat had told her one could feel overwhelmed when in intimate situations with a man, and Riona hadn’t been able to understand what she meant. She did now, and felt a new kind of fear—fear of her own reaction and response to this compelling persuasion of his. Thanks for feeding my obsession! This was a fun one! It was a fun one. I was in the same boat – but it worked out for tour stop – so YAY.! Thanks for stopping in!